Creating HTML sitemaps for websites is often a good idea to give visitors an alternative method for navigation and finding content. This page is a collection of various articles about making HTML sitemaps for users and SEO. Some of the articles assume you use one of our sitemap tools A1 Sitemap Generator or TechSEO360. These tools come with fully functional 30 days trials and run on Windows and Mac. Note: In addition to HTML/CSS/JS sitemaps, they can also create most of the other types of sitemaps. Tutorial on how to create simple HTML sitemaps. 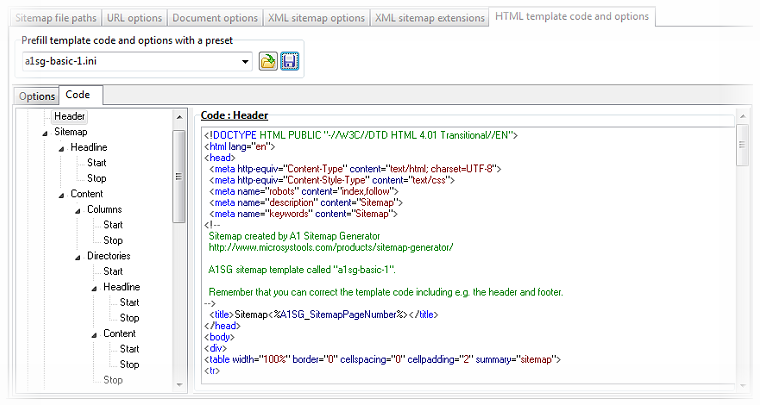 Information on how to customize and configure generated code in HTML/CSS sitemaps. After you have fully configured your project to generate HTML sitemaps, you can use the command line interface to automate and schedule automatic HTML sitemap updates. This list contains links to general articles and information about HTML sitemaps. General summary of what sitemaps are. An analysis by Jacob Nielsen about sitemaps and usability. Copyright © Microsys. All Rights Reserved. For legal and privacy see this.